I was so happy to hear the other week that Loblaws is selling discounted produce in Ontario and Quebec. It will be sold under a new No Name brand called “Naturally Imperfect” as a way to reduce food waste and make healthy food more accessible. This is just months after I watched a food documentary called “Just eat it – A food waste story” that talked about this specific issue. Farmers and wholesalers often throw out tonnes of food because it doesn’t meet grocery store “standards”. The documentary was filmed by two British Columbia film makers who embarked on an experiment to survive off food waste for six months. They lived off of food that would have otherwise been thrown out or discarded. This doesn’t include food that has gone bad but food that was completely safe to eat but somehow considered ‘unfit to sell’ because it wasn’t to spec, was getting close to expiring or didn’t follow Canadian labelling laws. The film brought to light the enormity of this issue and the logistical challenges around trying to keep food waste to a minimum. Some solutions such as Second Harvest and Quest were highlighted in the film but they also pointed out that half of the food that is wasted happens at the individual level. There are now taxes being put in place in certain provinces for throwing away food that could otherwise be used or repurposed. Food programs such as the food bank, Food Share, Second Harvest and Quest are all enterprises that are trying to help with the issue and Loblaws has rolled out the Naturally Imperfect No Name brand in Ontario and Quebec. These are all great things from a sustainability, food security and accessibility standpoint. It’s great that they are bringing these issues to light and there are practical things that are being done at the commercial and consumer level. I recommend that everyone watch the film if they have a chance. 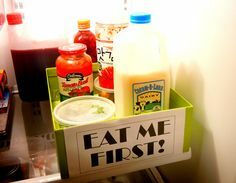 I started reducing my food waste immediately after watching it by taking one simple action: I labelled a bin in my fridge “Eat me first” where I put items that I need to use up. Like many people, I often lose track of what I have and things end up going bad before I remember to use them. I could save a lot of money (about a quarter of my grocery bill) if I got in the habit of using up items before buying new things. How do you reduce food waste in your home? What do you think of the new No Name Naturally Imperfect initiative at Loblaws?